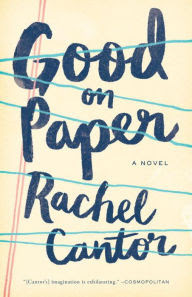 The Page 69 Test: "Good on Paper"
Rachel Cantor is the author of the novels Good on Paper (Melville House 2016) and A Highly Unlikely Scenario (Melville House 2014). Two dozen of her short stories have appeared in venues like The Paris Review, One Story, Ninth Letter, Fence, and Kenyon Review, and she has received fellowships from Yaddo, the MacDowell Colony, the Millay Colony, and elsewhere. She lives in Brooklyn, where she is always at work on another book. It had been two and a half decades since I was lyricist for the proto-punk band Gory Days (What’s behind Door Number Two? It had better not be you, you, you!). In our Den of Propinquity, we listened to qawwali and Raffi, but sometimes when I was alone I played the band’s one cassette—the relentlessly pornographic Second and Third Coming—tapping my tambourine ironically against my thigh. When I entered People of the Book, and heard that Benny’s raga had been replaced by a grunge band I didn’t recognize, I felt old. I also felt like pulling my ear drums out with my fingernails. And there she was, our sleepy connoisseur of noise, head resting on a pile of lit mags. Snoring, her hair no longer green but red, white, and blue. Dreaming up her next billboard, I was sure. Hello! I shouted in her ear. When she didn’t respond, I went behind the counter and switched CDs: out with the Bloody Monkeys, in with Nikhil Banerjee. Hey! Marie said, lifting her head. Who said you could do that? See Cantor's list of the ten worst jobs in books. The Page 69 Test: A Highly Unlikely Scenario.